story PHIL HESTER art ROMANO MOLENAAR cover B SHELDON MITCHELL CELEBRATE THE FIFTEENTH ANNIVERSARY! The Darkness has mustered its considerable defenses in its home dimension to crush its prodigal son and current bearer, Jackie Estacado. 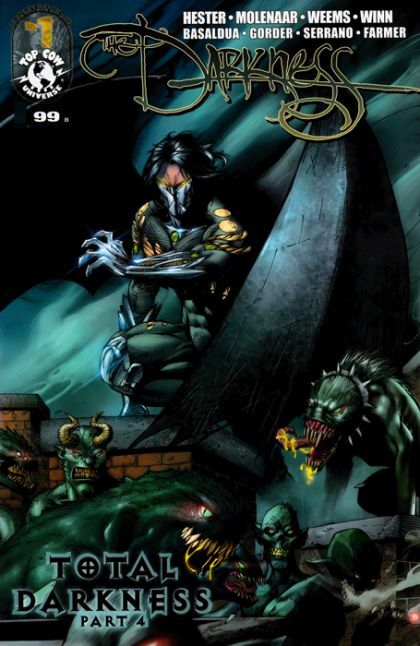 Long time writer PHIL HESTER (WONDER WOMAN, THE GREEN HORNET) and ROMANO MOLENAAR (THE DARKNESS II: CONFESSION) build to the crescendo that will be landmark THE DARKNESS #100 when Jackie will come face-to-face with the source of his power and misery.